The Park Hill Guest HouseThe Park Hill / Gwesty Bryn Parc is located in a fine Victorian building, traditionally built of local stone and slate in the 1860's. The hotel's nine double/twin rooms are equipped with all modern facilities, recently refurbished and are all en-suite. 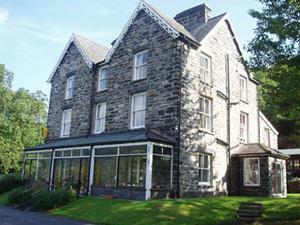 The hotel is set in an acre of lush gardens overlooking the beautiful village of Betws-y-Coed, the Llugwy and Conwy Valleys and the surrounding mountains of Snowdonia. Incorporated in the hotel is a heated indoor swimming pool with a jacuzzi type spa and a sauna for the exclusive enjoyment and relaxation of our resident guests. Pool and sauna are open all day and night. Renowned for its informality and its teddy bears.